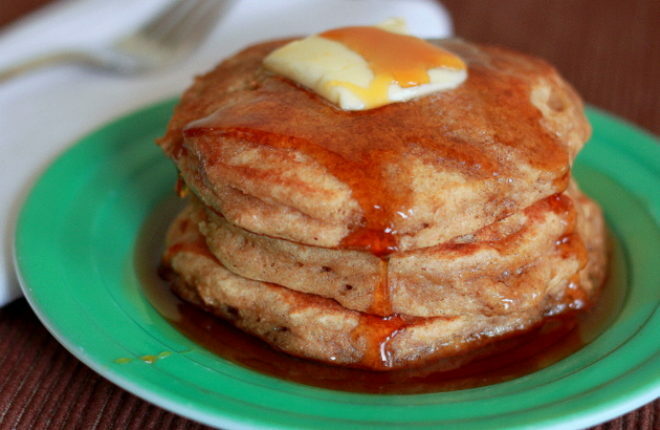 Applesauce Pancakes? Oh yeah. Apple Cider Syrup? Oooooooh yeah. Kid-friendly and gruntworthy, this Applesauce Pancake recipe is easy to whip up, and is absolutely delicious, especially topped with the also-easy Apple Cider Syrup. Other than my most recent pumpkin seeds recipe, it’s been a little while since my guy’s given any of my kitchen creations a grunt, let alone two. I know he tends to be a bit stingy with his grunts – they’re reserved for only what his dude-ly palate finds the best of the best. Still, I was starting to get a little pouty – give something a grunt already, man! So when he gave Applesauce Pancakes with Apple Cider Syrup not just one, but two grunts up, I felt like I’d won a little prize. 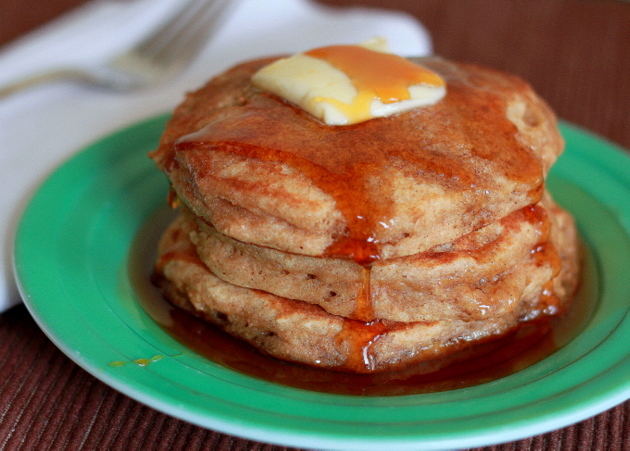 These surprisingly fluffy little pancakes have a nice subtle apple flavor enhanced by cinnamon, vanilla, and nutmeg. The syrup, on the other hand, packs a serious apple wallop with caramel-like overtones. Together: Apple breakfast nirvana, worth a coveted Two Grunts Up. Victory is mine, and I didn’t even have to put bacon in it! Over medium heat in a medium saucepan, combine the cider and brown sugar, then add the cinnamon stick. Bring to a boil, then reduce heat to medium low and continue simmering, stirring occasionally, for about 30 minutes until the mixture is reduced by about 2/3. Remove from heat and let cool (it will thicken as it cools). In a large bowl, mix together the flours, brown sugar, baking powder, salt, cinnamon, and nutmeg. In a medium bowl, mix together the eggs, milk, applesauce, and vanilla. Stir in the melted butter. Stir the wet ingredients into the dry ingredients, just until well-incorporated. Do not overmix. Pour batter by 1/4 cupfuls onto a griddle heated to 350 degrees (or a pan on the stove on medium to medium-high heat). The batter will be somewhat thick – you may have to spread it around a bit with the measuring cup after you pour it. Don’t fret if they’re not perfect circles – rustic is always good! Cook until browned by both sides, and pancake is cooked through. Serve with butter, if desired, and Apple Cider Syrup. Those sound really good! How do you think it would be if I substituted apple butter for the applesauce? If I did that I would have to nix the other spices included. I think the apple butter sub might work great – maybe just add a little more milk so you have the right consistency. The batter is pretty thick as it is. Annie, thank you so much for the award! Those pumpkins look delicious… I want one right now. I LOVE the sound of the homemade apple cider syrup! Perfect topping for pancakes :). I would LOVE this!!! I have to try the apple cider syrup. Oooh… that sounds great. 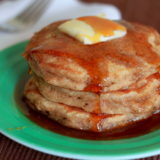 I’ve eaten potato pancakes with applesauce (divine) but never plain ol’ pancakes. I like. Woops! In my own haste to read this delicious recipe, I totally overlooked where it pretty clearly says “yields 15 pancakes” at the top. Sorry sorry sorry! 🙂 No worries, Kath! Yep, about 15, but they’re pretty small. Oh my these look wonderful. Love the syrup.